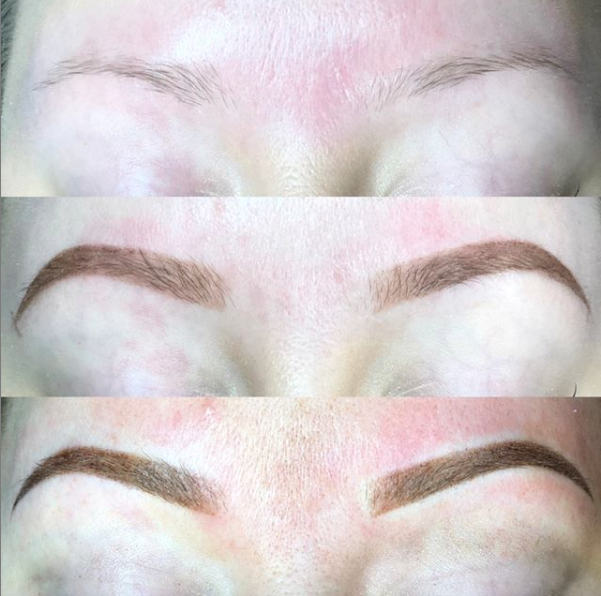 If you’re a fan of regular brow tint, then you’re going to love henna brows. Henna gives you defined brows that last weeks longer than regular brow tint. It’s a quick, easy, and painless way to get perfect brows. As shown in the video on the right, an aesthetician applies henna, an all natural dye that temporarily stains the brow hairs as well as the skin beneath the brows. The dye is applied using hairlike strokes with a brush to create the illusion of depth and fullness. Any sparseness is temporarily filled, giving you the look of lush, full brows. After the dye is applied and you have your desired brow shape, wax is applied near the brows to remove any stray hairs. Finally, a spool brush is used to fluff the brows. The end result: gorgeous brows. Henna tint plus brow shaping is $40. Regular brow tint lasts about a week. But henna brows last weeks longer depending on the health and state of your skin. Oily skin or skin that’s in a state of constant shedding won’t hold pigment well. As a result, their results may not last as long as someone who doesn’t have the same skin conditions. For more info on the types of skin conditions and how they can affect your skin’s ability to retain pigment, check out Am I Candidate for Microblading? It’s a great read if you’re also considering microblading, too! Give us a call at 302-656-0555, 302-378-8880 to book your service.